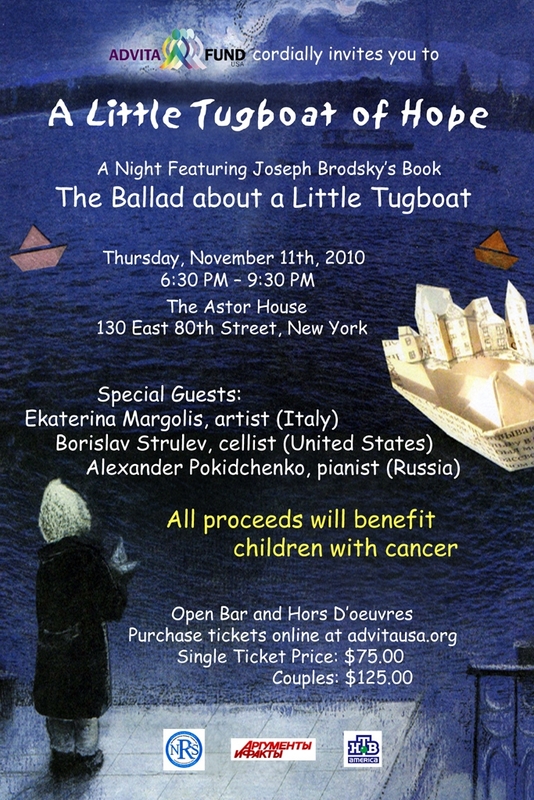 Advita Fund USA is proud to present a unique publication of Joseph Brodsky’s book “The Ballad about a Little Tugboat” followed by a cocktail party on Thursday, November 11, 2010 at The Astor House, 130 East 80th Street, New York, from 6:30pm till 9:30pm. 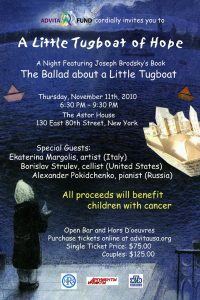 To honor the great poet, writer and Nobel Prize Laureate on the 70th anniversary of his birth in May 2010, Pink Giraffe publishing house in Moscow released the book “The Ballad about a Little Tugboat”. The book was designed and illustrated by an acclaimed artist Ekaterina Margolis together with young cancer patients. The publication became truly an international endeavor. Vivid drawings by dozens of Russian children – sometimes their last – decorated the entire book; Ekaterina Margolis in Italy made the layout of the book, illustrations and wrote an afterword; heirs of Joseph Brodsky in the US relinquished the copyright on the poem; Pink Giraffe and News publishing houses in Russia contributed paper and printed 10,000 copies of the book. Everyone involved in this exceptional project contributed their time and efforts for free. Only a limited number of copies of this unique book will be offered for sale during the event. The event is organized by Advita Fund USA in collaboration with Joseph Brodsky Memorial Fellowship Fund and is supported by three major media sponsors: Argumenty I Fakty (international edition), the largest and most popular Russian weekly abroad, NTV America, the premier Russian-language channel for Russian audiences in the United States, and Novoye Russkoe Slovo, the oldest Russian-language newspaper in the USA as well as The Department of Slavic Languages and Literatures at Princeton University and The Russian International Association of Columbia University. The art made by our special guest Ekaterina Margolis, featuring Venice, Joseph Brodsky’s much-loved city, will be on display along with works made by talented young cancer patients. Musical Performance – Borislav Strulev, world-renowned cellist, presents Alexander Pokidchenko (1964) – one of the most talented musicians, composers of his generation. Alexander is a member of the Union of composers of Russia and the honored artist of Russia (2007). Alexander’s natural desire to act inspires him to give poetry readings, write and perform in literary-musical solo concerts. The money raised during the event will be used for financial assistance for the cancer patients from Russia and the former Soviet Union.